There are several Office 365 for business plans that you or your organization can choose from when you sign up for one of Microsoft's cloud services. After your organization signs up for Office 365, the admin can assign different Office 365 licenses to each user account. The different licenses include different services, such as SharePoint Online and Skype for Business Online. See the different Office 365 for business plans. Note: This topic is for Office 365 for business. If you have an Office for home product and you're looking for where to install Office, see Install or reinstall Office on a PC or Mac. If you experience a problem in Office 365 – for example, you can’t use or install Office on a device – it could be that you don’t have the necessary license that enables that service or you don't have a subscription that includes the desktop applications which require installation. To fix this, you can contact your admin or IT staff for help, or if you're the admin, you can add the license yourself. If you work in an organization that uses Office 365 for business, use the steps below to find out what Office 365 for business product or license you have. 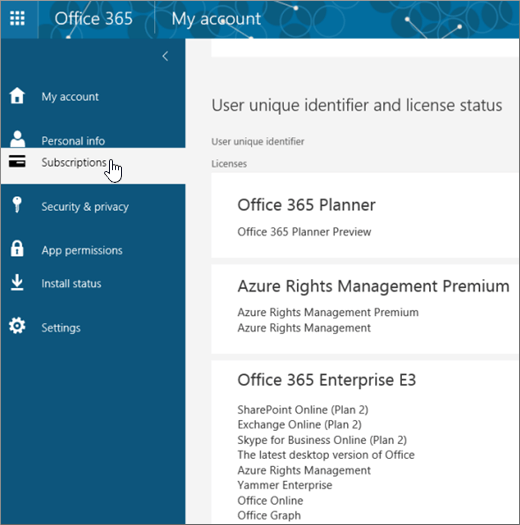 If you're an admin and you want to know what Office 365 subscriptions have been purchased for your organization, follow the steps in What Office 365 for business subscription do I have? instead. Sign in with your work or school account at www.office.com/signin. Sign in with your work or school account at login.partner.microsoftonline.cn. Sign in with your work or school account at portal.office.de. 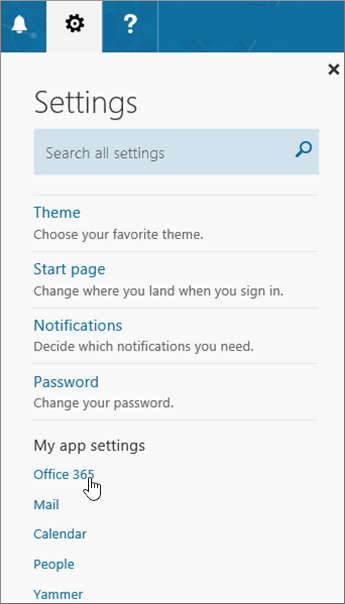 Click Settings, and then under My app settings, choose Office 365. On the My account page, choose Subscriptions. Tip: For more about issues relating to installing Office, see Troubleshoot installing Office. What can I do if I don’t have the needed product or license? If you don’t have the product or license you need, contact your Office 365 admin or IT staff for help in getting that license or finding an alternative. Or, if you are the admin, you can add the license yourself. See Buy licenses for your Office 365 for business subscription and Assign licenses to users in Office 365 for business. In some cases, an admin may need to add an Office 365 plan or switch you to an Office 365 plan that includes the services you need. See Switch to a different Office 365 for business plan. Learn more about the different Office 365 for business plans available to your organization.